Bubbles has early dinners, but always sits at the table with us when we have ours. She usually gets her own finger food - baby biscuits, broccoli florets, steamed carrots, fruits etc. Recently, we have started to give her some of our rice, as she is really keen on having whatever we eat. She loves it! I am reminded that I used to ask for "Nothing rice!" as a tot. 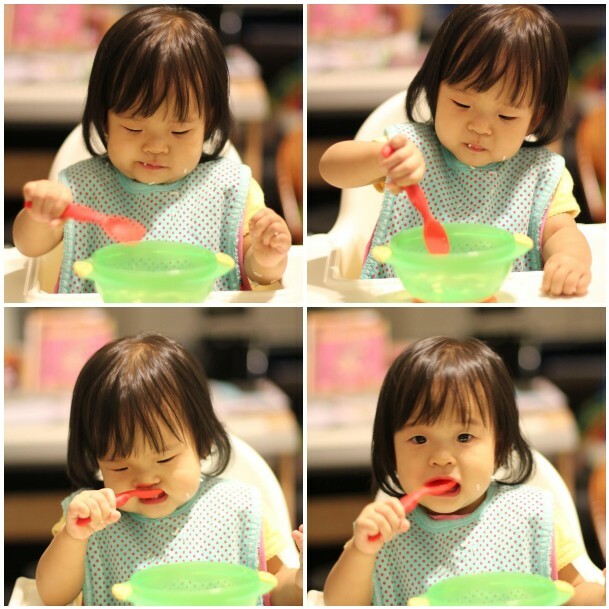 She must have inherited the rice-enjoyment gene. Rice - what fun to eat! Little itsy bits! See the rice morsels all over her mouth! hahahaa..
what a clever girl! She feeds herself! K 'puts' his spoon in his mouth and then chews on it, hardly called 'feeding himself' yet. It gets all over! Her hair too! hahaha.. it must be a hard chore for u after the eating session.